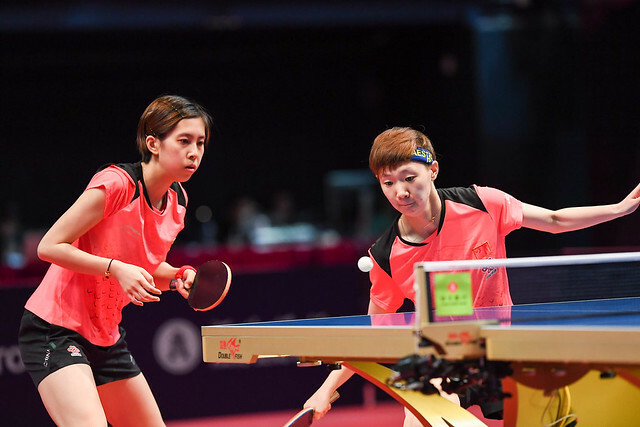 A 21st birthday but for Chen Xingtong, the no.6 seed but there were no presents from colleague, Wang Manyu in the final of the Women’s Singles event at the Seamaster 2018 ITTF World Tour Hang Seng Hong Kong Open on Sunday 27th May. The no.3 seed, Wang Manyu emerged successful in six games (12-10, 11-8, 3-11, 11-6, 4-11, 11-9). Wang Manyu captured the opening two games after, in the first Chen Xingtong had saved two game points; the third was totally different. Chen Xingtong could do nothing wrong, for Wang Manyu it was the totally reverse scenario. Chen Xingtong established a 9-1 lead before surrendering just two further points to seal the game. A recovery in the offing, excelling over the table, it was back to the pattern of the opening two games; Wang Manyu controlled the play to establish a three games to one lead. The fourth game similar to the first two, the start of the fifth was similar to third; Chen Xingtong raced into a 6-1 lead, Wang Manyu won the next two points, Chen Xingtong called “Time Out”. The break worked, she lost just one more point to reduce the match arrears to one game. A good start and Chen Xingtong had accelerated; in the sixth game that essential good start did not happen. Wang Manyu gained a 6-3 lead; Chen Xingtong reduced the deficit to one point at 7-6, Wang Manyu elected for “Time Out”. Chen Xingtong won the next two points, the rallies fast and furious, any good fortune on the side of Wang Manyu, at 10-8, she held two match points; the first was saved not the second, a ripping backhand secured victory. Success for Wang Manyu meant that in what is now six ITTF World Tour Women’s Singles finals, she has won three times. Last year she won in Austria, whilst having been the runner up in Australia and Qatar on both occasions beaten by colleague, Chen Meng. Likewise this year, once again she had to settle for runners up spot in Qatar, losing to Liu Shiwen, having earlier in the year won in Hungary. Notably it was the fourth occasion Wang Manyu and Chen Xingtong had met on the ITTF World Tour; previously they had confronted each other last year in Australia and in Germany, whilst earlier this year they had faced in each other in Hungary. On all three occasions Wang Manyu had prevailed, in Hong Kong she made it four.